This morning (or afternoon) head over to Jennifer Perkin’s blog for a review, Q&A and another chance to win Crochet Adorned. We talked about why I wrote this book (as opposed to a “straight up all crochet, all the time” book), what kinds of garments I’ve made over, and my personal history of adorning with crochet. You can see some “my project/the project in the book” photo comparisons, too, like the Modern Harlequin Dress below. Paul and I are still recovering from the long drive back, but I actually am going to work today (what was I thinking)? I feel that I owe a proper Portland Roundup, at least the crafty hilights– hopefully that will happen sometime this week. I just LOVE this dress! 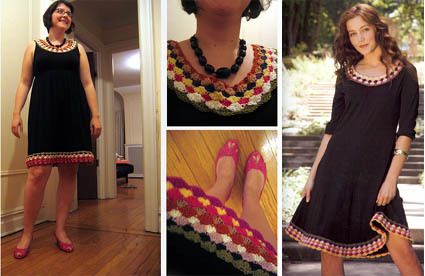 And the top with the crocheted yoke! I am already going through my closet and fabric stash to see what I can use to make both these when my book arrives. Two weeks seems very long!